Detailed Restoration - Complete Fuel Closet - Tire Patch Tools - 3 Cell Tank This 1931 Ford Model A Tanker takes you back to the early days of the oil and gas industry with its striking Texaco logos and bright red tank standing out beautifully from the rich black paint. This amazing piece of history is in beautiful condition and was subject to a $40,000 restoration according to the previous owner. This unique tanker is perfect for anyone who loves cars and oil & gas memorabilia, and would surely be an outstanding addition to any collection. This remarkable truck is equipped with a 4 cylinder engine connected to a manual transmission driving the rear wheels, a 3 cell tank with a complete fuel closet, and tire patch tools as well. Come in or call today for your chance to own this rare and remarkable truck! Please contact one of our expert sales consultants for the most complete information on this beautiful vehicle. They will be happy to answer any questions you may have, give you a complete walk-around, and in the process, supply you with the most detailed description of the vehicle. We gladly accept trades! We offer financing options on your purchase through only the best classic car financing companies in the business, with approved credit. Our customers buy with confidence. For over 30 years we have bought and sold quality classic collector cars all over the world. Contact Ideal Classic Cars of Venice, Florida today! Located in beautiful Venice, Florida, the Ideal Classic Cars Museum & Showroom is home to over 100 gorgeous classic cars, trucks and motorcycles. With over 30 years in the car business under the belts of the owners, they decided to expand to south Florida in 2010 - opening the doors to their dream classic car showcase. As a way to give back to the community, our museum offers free admission to the public, which attracts and inspires car enthusiasts; both young and old. Ideal Classic Cars is a full service classic automotive dealership and museum, specializing in buying, selling, and trading as well as consignments, financing, appraisals and domestic and international shipping. Our 27,000 square foot showroom is situated on 3 acres and receives approximately 200 walk-in visitors per day. 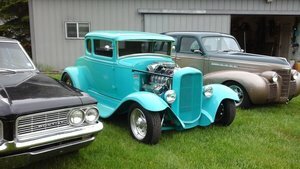 We offer the full array of high quality investment-grade restorations as well as driver-quality collectible cars from the 1920's to the 1970's. The ICC Museum, one of the hottest tourists attractions on Florida's southwest coast, is lined with hot rods, street rods, European models, muscle cars and originals - all available for purchase. We advertise world-wide on numerous platforms with the goal of becoming a household name in the classic car world.